Published at the beginning of the twenty-first century, Sustainable Landscape Construction took a new approach to what was then a nearly new subject: how to construct outdoor environments based on principles of sustainability. This enormously influential book helped to spur a movement that has taken root around the U.S. and throughout the world. The second edition has been thoroughly updated to include the most important developments in this landscape revolution, along with the latest scientific research in the field. It has been expanded to provide even more ideas for designing, building, and maintaining environmentally sensitive landscapes. 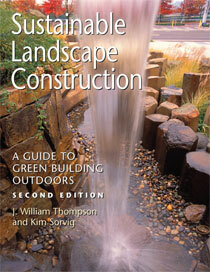 It is essential reading for everyone with an interest in "green" landscape design. Like its predecessor, the new edition of Sustainable Landscape Construction is organized around principles that reflect the authors' desire to put environmental ethics into practice. Each chapter focuses on one over-arching idea. These principles of sustainability are clearly articulated and are developed through specific examples. More than 100 projects from around the globe are described and illustrated. A new chapter details ways in which landscape architectural practice must respond to the dangers posed by fire, floods, drought, extreme storms, and climate change. Sustainable Landscape Construction is a crucial complement to basic landscape construction texts, and is a one-of-a-kind reference for professionals, students, and concerned citizens. "This book should be adopted into the curricula of landscape architecture programs and should be on the shelves of most practitioners, because it is indeed a guide to making the changes in thinking and practice necessary for a sustainable future." "This is a guide that provides inspiration and answers for the home- or land owner, as well as for the construction and landscape construction industries. It should be used by the public to request accountability. It is also so well written that, unexpectedly, it's also good bedtime reading." "Sustainable Landscape Construction is a highly useful resource to complement existing texts and puts forward a strong case for sustainable practices through economic, aesthetic and functional arguments." "One of the major strengths of this book is the application-oriented approach, providing examples of sustainability in existing projects." "In the revised and updated second edition of Sustainable Landscape Construction: A Guide to Green Building Outdoors, J. William Thompson, the editor of Landscape Architecture, and Kim Sorvig, who teaches at the University of New Mexico, lay out 10 principles for promoting sustainability in landscape architecture and design. They do this so thoughtfully that it's worthwhile reading for any design professional...The authors carefully distinguish their approach from conventional landscape design and tradition (premodern) practices, while drawing on both. And they don't fall into the trap of assuming that doing the same things with less impact will be sufficient...The book also includes a distinctive feature that anyone who has unwisely tried to search 'landscape' online will appreciate: The bibliography subject headings at the end of each chapter include a list of potentially useful Internet search terms."